I won’t make it a habit to write about this kind of place – not really a BBQ restaurant, but one that does specialize in BBQ. I’m choosing to give a quick write up on this because it was just a good place all around. The atmosphere was cute. There’s no other word for it. There were curtains on all the windows and you really felt like you were in somebody’s grandma’s kitchen in the south. 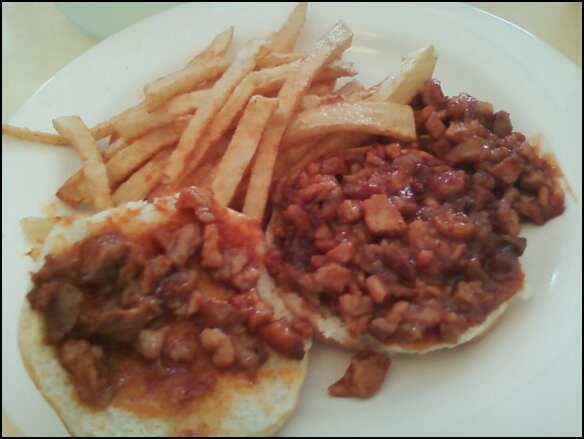 I got the chopped bbq sandwich with hand cut french fries. The chopped bbq was actually spare rib meat. The rib meat was tasty, but the sauce was pretty generic. The fries were great and tasted completely home-made. 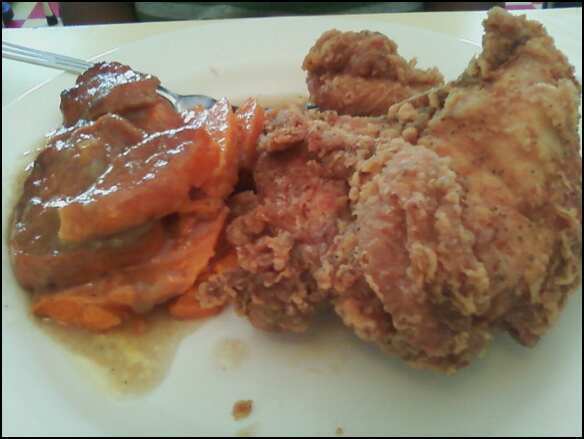 The real highlight wasn’t really bbq, but my compatriot’s fried chicken. It had amazing texture and the spices ran deep with intensity. Her side dish of candied yams was outstanding as well. All in all, the prices were a little high but they run great lunch specials! Both dishes included free homemade lemonade and cornbread for $7! Great atmosphere, good food and a decent value.